Wow...Poornima's Cook Book has reached 2,00,000 page hits today!!!! Thanks to all my friends and followers of the blog. It is your encouragement through likes and comments that keeps me going! To celebrate this occasion I want to share my mom's recipe which is one of my favorite. Though my mom used to prepare variety of chutneys, I always prefer to have podi as an extra side dish! 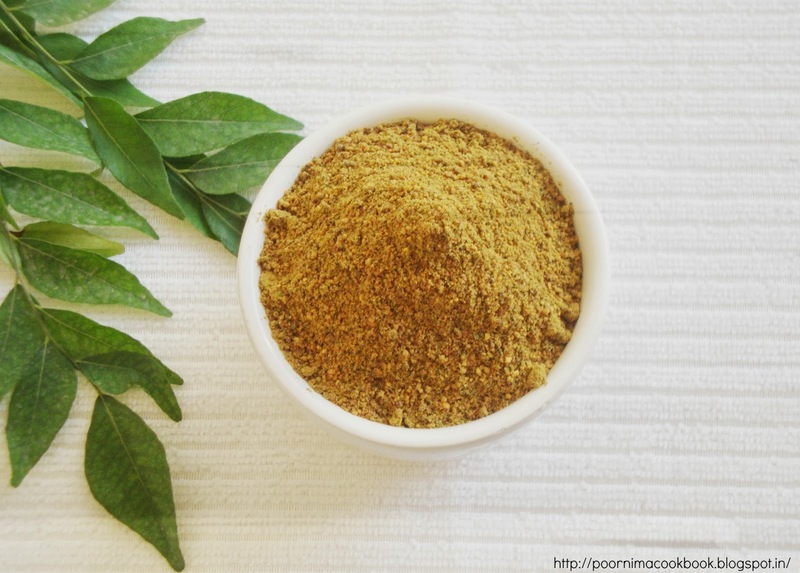 This Curry leaves podi is a healthy variation to the usual Idli milagai podi. Most of us have the habit of throwing the curry leaves from the dishes and not eat them; here is a way of including this iron rich green leaf in our daily routine. 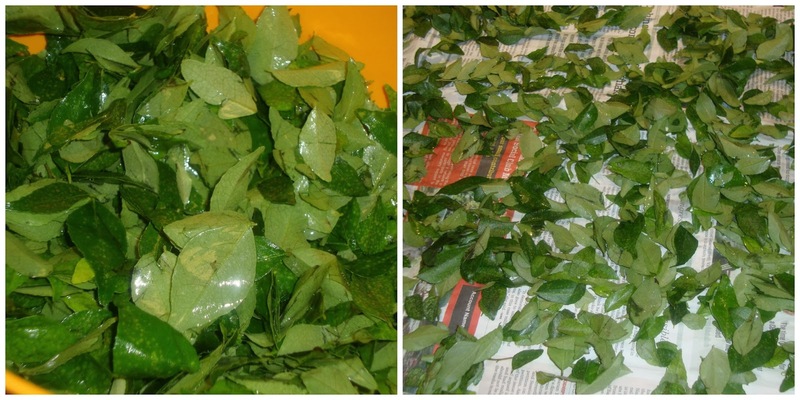 Wash and drain the curry leaves; spreading them in a newspaper or cloth and allow to dry in shade. Once the leaves dry off and you feel no moisture, dry roast in a pan till it becomes crispy (or spread in a plate and microwave for 2 to 3 minutes). Make sure to mix it in between. Once it becomes crispy; keep aside and allow it to cool (I felt microwave method quick and easy). Heat oil in a kadai; roast red chillies, urad dhal and channa dhal till the colour changes to golden brown (make sure not to burn the dhals). Transfer this into a plate and allow it to cool. 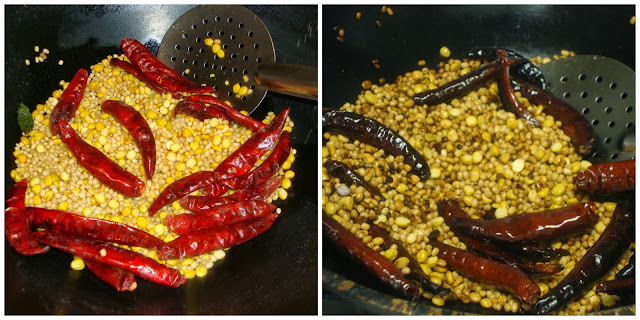 After it is completely cooled, grind curry leaves and add the roasted dhals, red chillies, asafoetida and salt in a blender / mixer and grind it to a coarse powder. 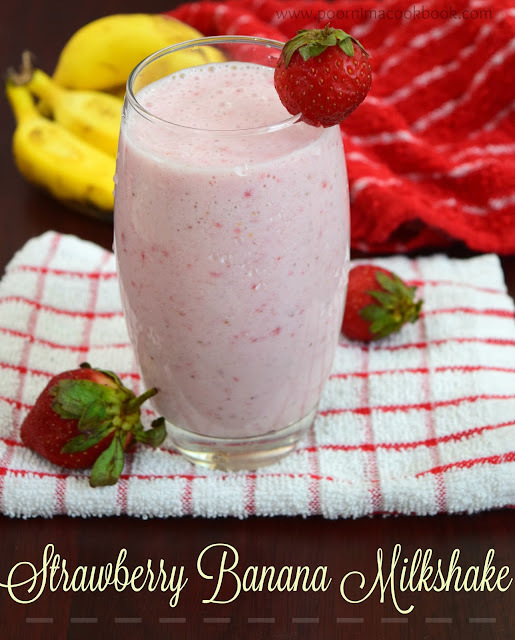 Nice recipe , thanks for sharing ! 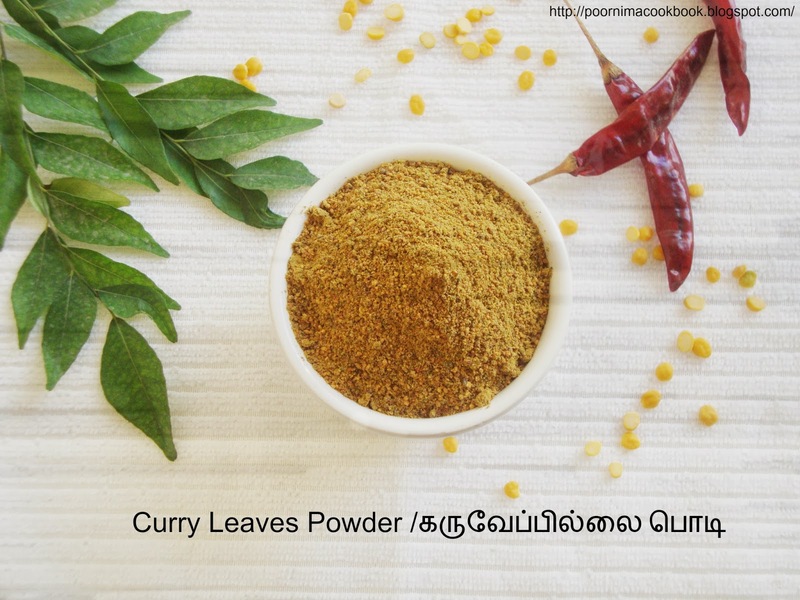 Iron rich Curry leaves powder.well explained with stepwise pictures. 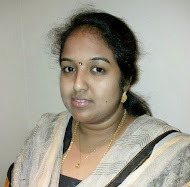 Poorni ,congrats! and the photos of idli milagai podi look really nice! 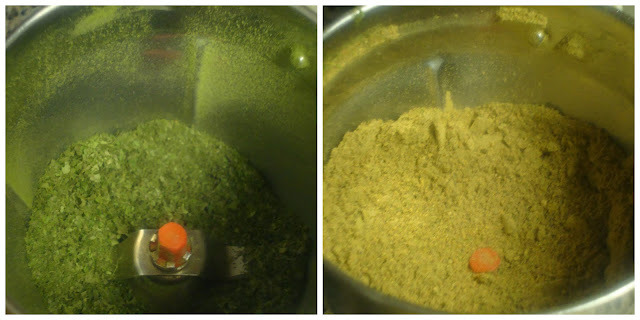 wow thats an very very flavorful podi :) very nice presentation and clicks dear !! Podi looks so colourfull. healthy too. 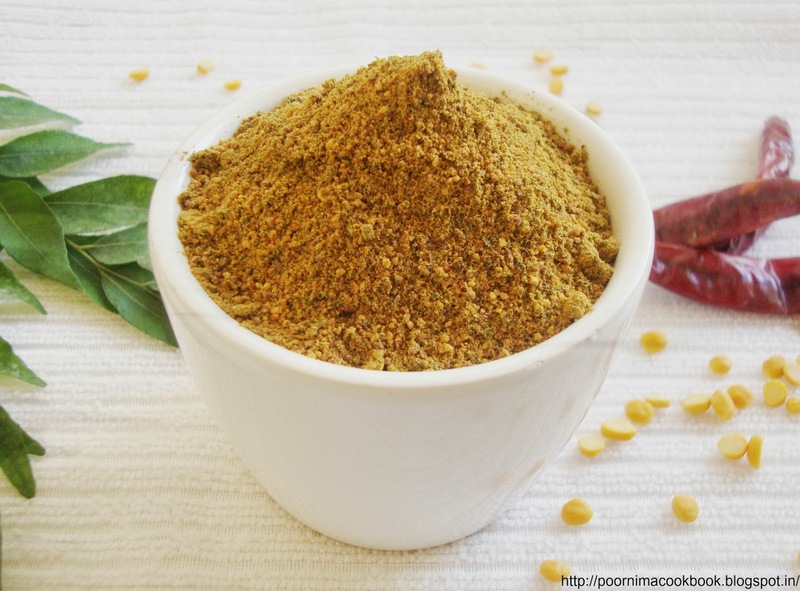 A healthy podi that comes in handy when you go out of ideas for chutneys and gravies. Curry leaf is a wonder herb. 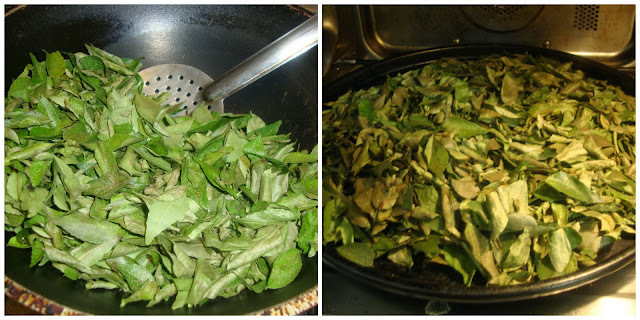 Generally we use curry leaves in dishes for good taste and for fragrance. After that we use to throw away has many qualities like medicinal properties. In the food items, for beauty curry leaves are most useful. Curry leaves are good remedy for indigestion. They are also useful for weight loss. Curry leaf oil is the best herbal medicine for good health, hair and skin health. It is useful for total beauty of the skin and remedy for total skin diseases. Curry leaf oil prevents hair falling, greying of hair, dandruff, pimples, dark sports and white spots.